Custom rocking chair cushions for indoor and outdoor use can be filled with your choice of foam (indoor use) or CumuPlush™ filling (outdoor use). Deluxe custom rocking chair cushions for indoor and outdoor use are wrapped with an additional layer, creating a crown effect, and provide you with an option of buttons. 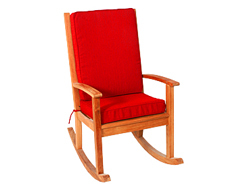 Optimal custom rocking chair cushions for indoor and outdoor use offer the most comfort and resistance. These rocking chair cushions are comprised of four components: foam, Memory Foam MicroGel, batting, and enclosed water-resistant ticking. Whether on the porch, in the baby's nursery or in your living room, rocking chairs are the ultimate calming comfort; but without an appropriate rocking chair cushion, your relaxation time could turn into back pain and general discomfort. Replacement rocking chair cushions can bring back the peace to your space. With hundreds of fabrics and several fill types to choose from, creating your custom rocking chair cushion has never been easier. 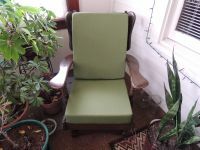 During the ordering process, you may choose to have your custom rocking chair cushions made connected as one piece, or as separate seat and back cushions. Optional ties may be placed at your choice of locations in order for your custom rocking chair cushion to stay properly in place during use.